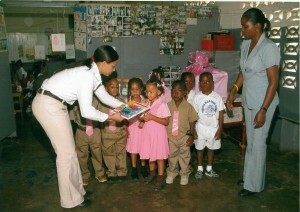 During our 2007 Reunion in Ocho Rios, we set out to partner with The Sunset Jamaica Grande in assisting a local school. Through much generosity from all who attended, we were able to gather school supplies to donate to the Pimento Walk Basic School. On September 13, 2007, Dania Phang, Training and Development Manager of the Sunset Jamaica Grande presented the supplies collected to Principal Campbell and the children of the Pimento Walk Basic School. Principal Campbell said “the supplies were well received and will be utilized by the student body to garner higher education”. In recognition of our effort, we received a certificate of appreciation signed by Clifton Reader, the Jamaica Grande’s General Manager. Mr Reader also sent us a personal letter of gratitude to which he thanked us for support of not only the resort, but investing in the youth of Jamaica. The Committee was proud that we were able to accomplish this small but not insignificant task. This was the first of many good faith gestures by the newly formed Hibbert Family Foundation.